I believe it was Rock Paper Shotgun who referred to our previous game, Dungeons of Dredmor, as “a randomly generated spinning roulette wheel of glory and death” (or something like that, anyhow.) Regardless, this is a good design philosophy and one that we can all agree upon. To this end, it is good to put some random events in games – they sparkle things up. 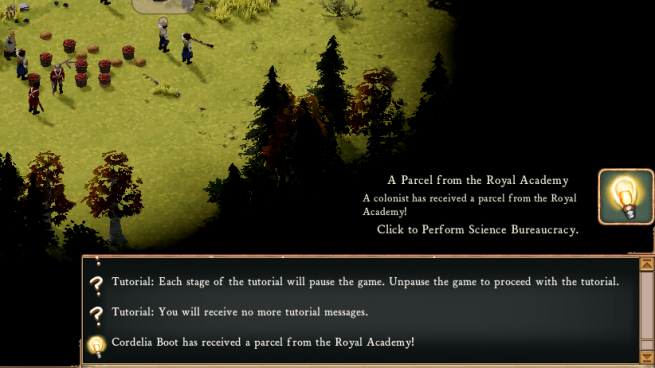 We also have said that one of the key driving forces in Clockwork Empires is your characters; it is very good for them to do various things, based on their personality, character traits, and moods. We want characters – and who they associate with, and who they are organized with – to start making a noticeable impact on the game beyond the incidental impact of being nearby other characters when they do something that may, or may not, affect other members of your settlement. Dwarf Fortress handles this with Strange Moods; a Dwarf will lock themselves in a room and go insane – or, maybe, produce a strange artifact. 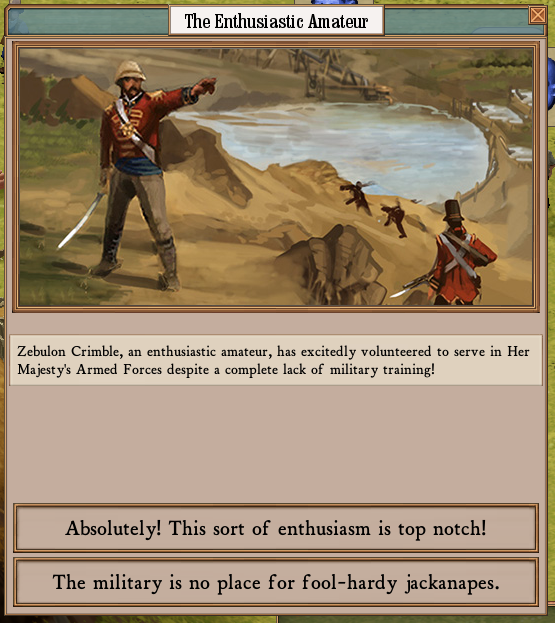 Crusader Kings 2 handles this with various events happening, ranging from jousting tournaments to attempting to turn lead into gold. To generalize this: we have random Character Events. Nope, nothing ominous to see here. Because this is all configurable via our XML-and-Lua requirements system, we can have a job that requires two people with specific traits. For instance, we can require two characters that are both communists, or “a character with the strange mood and an eldritch artifact”. 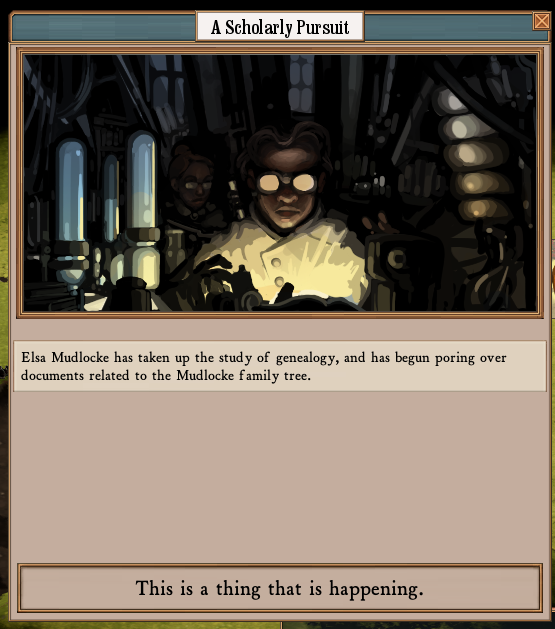 Having random events also provides opportunities for finding out a little bit more about the backstory of the Clockwork Empires. (Who is this Royal Academy? Why do they keep sending dangerous parcels? Do we ever actually get to meet Lord Palmerstoke?) We will be populating the game with some character events for Revision 36, and will add more moving forward throughout Early Access. Science Bandits: regular bandits with more goggles. This is a fantastic idea. Since CE has eschewed the RPG-like skill system of DF (for good reasons, I’d argue), stuff like this will be super important in order to make your colonists more than just a generic pair of worker-hands. Speaking of which, does this system encompass things like marriage/moving in together/forming friendships/swearing to wreak a Terrible Revenge, or are relationships between colonists handled separately? The link in the email goes to the previous blog entry (The Fog of War and Other Stuff), but other than that this was a lovely blog post. If you hadn’t mentioned it, I wouldn’t have noticed it wasn’t written by the usual reprobate person. Keep up the good work! I love when people treat science as something that can be measured with a metric unit. I can just see a science bandit walk up and hold a SCIENCE MEASURING DEVICE to the crate and deciding… no, this is just a bit below our standards. This is delightful. This is also actually the first post that’s got me really interested in playing CE, not just watching its development For Education. I kind of hope the choices are worded the same way in the final game. 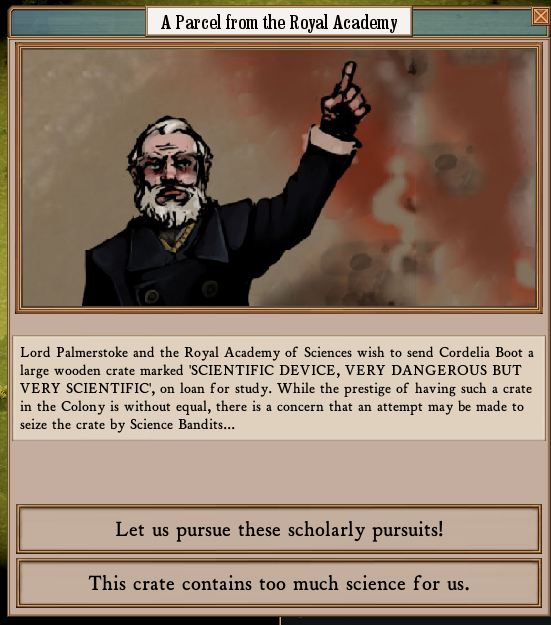 “This crate contains too much science for us,” indeed!